All the ballpark food you can want, delivered right to your seat. Next time you’re at the ballgame, your phone might get you some peanuts and Cracker Jack. I was at a Mariners game at Safeco Field earlier this week when an announcement encouraged the crowd to order concessions using their Android phones. 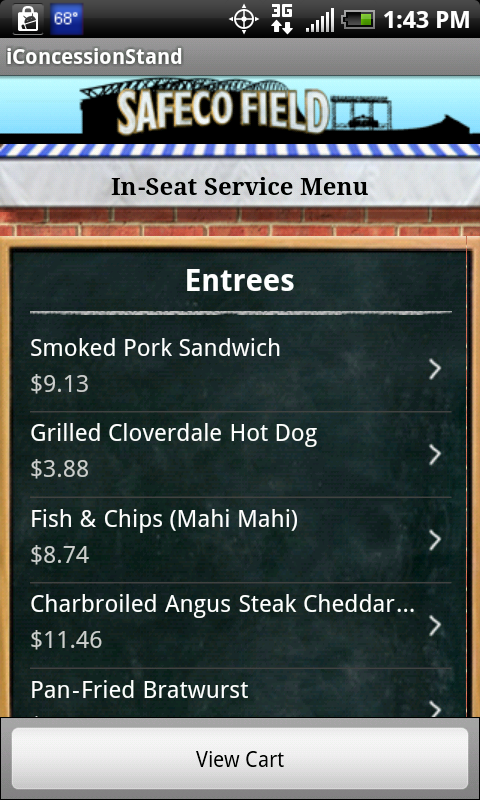 The app, from iConcessionStand.com, allows you to select food, drinks and team merchandise and have it delivered to your seat. When you launch the app, it asks for your seat location. It uses GPS to verify that you’re at the ballpark; you can’t order if you’re not there. Pricing for the service is relatively modest. There’s a 99-cent service charge and a required tip. That’s well worth it to avoid long concession lines. (Pricing for food and drink, however, is the standard astronomical ballpark rate.) A $10 minimum purchase is required, but one beer gets you most of the way there. Delivery is quoted at 30 minutes. Selection was more limited than what was available on the concourse, but wide enough. The ballpark isn’t the only place your phone can feed you. Chipotle offers ordering through an iPhone app. Build your order, pick a store for pickup, and enter payment information. When I arrived at the store, they’d received the order but it inexplicably had a delayed pickup time. Pizza Hut has its own iPhone ordering app and Snapfinger offers ordering from a range of chains, including Outback, Baja Fresh, California Pizza Kitchen and Subway. This integration from the virtual to the physical world will become increasingly common over the next couple of years as point-of-sale systems become better integrated with the Internet.